Ground-breaking technology now enables Siloam Thomas Eye Hospital to avoid blindness and other diabetic complications. Located in India, the hospital uses a high resolution camera which provides early diabetes detection. 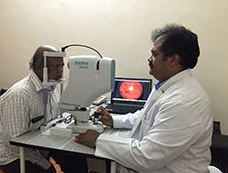 Dr Devdutt Thomas who heads the medical work explains, ‘This equipment is important to record and store the examination for early identification of diabetic eye disease. Then, too, it reveals glaucoma changes in the optic nerve.’ Hospital staff are committed to serving marginalised people such as the poor and leprosy patients. This ground-breaking equipment will help dedicated workers as they reach out to the wider community.